Dr. John Sprinkle, author of Saving Spaces: Historical Land Conservation in the United States and Crafting the Preservation Criteria: The Origins of the National Register of Historic Places. After working as a private sector historic preservation consultant for a decade, John Sprinkle joined the National Park Service in 1998 where he worked for the National Historic Landmarks Survey and the Federal Preservation Institute before joining the Park History program as the agency’s Bureau Historian. He holds a doctorate in American history and a master’s degree in historical archaeology from the College of William and Mary. In addition to Saving Spaces: Historical Land Conservation in the United States, Dr. Sprinkle is the author of: Crafting the Preservation Criteria: The Origins of the National Register of Historic Places. He serves on the City of Alexandria, Virginia’s Old and Historic District Board of Architectural Review and is an Adjunct Associate Professor in the School of Architecture, Planning, and Preservation at the University of Maryland, College Park. 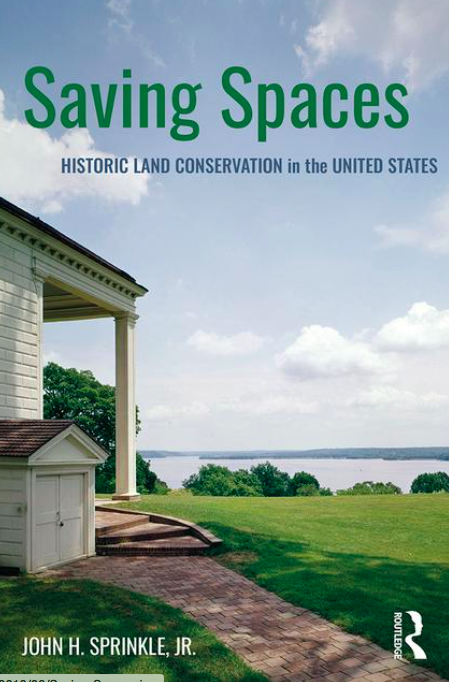 LLO: In your new book, Saving Spaces: Historic Land Conservation in the United States, you mention that much of your passion for preservation came from personal experiences. Can you elaborate a bit on this topic? What got you into the field and what keeps you involved? 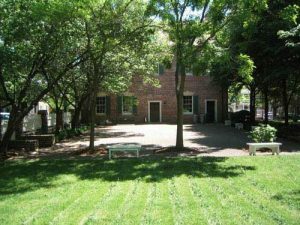 JS: Lloyd House in Alexandria, Virginia started my interest in the intersection of land conservation and historic preservation programs. I was fortunate to serve on the Alexandria Historical Restoration and Preservation Commission (AHRPC) for several years, where I learned the story of how Lloyd House was saved back in the late 1960s because of a HUD program that helped local communities acquire open space, including parcels that contained historic properties. My interest in the history of easements as a conservation tool came about because the AHRPC holds a variety of preservation and conservation easements within the city and a local news story about the proposed conversion of a Land and Water Conservation Fund parcel to alternative uses helped initiate another chapter. From Alexandria it was a just short journey down the Potomac and the story of Operation Overview and the protection of the Mount Vernon viewshed. As I began work it became apparent that conflicts between federal historic preservation and surplus property mandates were another important story to tell: after World War II the potential for adaptive use of federal buildings helped shape how the preservation movement responded to urban renewal. Finally, I have a significant interest in agricultural land preservation as my wife and I are stewards to our 300 year-old family farm operation on Maryland’s Eastern Shore. LLO: Saving Spaces is a wide-ranging text, which makes for great reading! One section that intrigued me personally is chapter 4. It focuses, in part, on the complex role of HUD in preservation and land conservation. On the one hand, HUD funded urban renewal. On the other, it gave significant amounts to park creation. Can you discuss this history for readers? 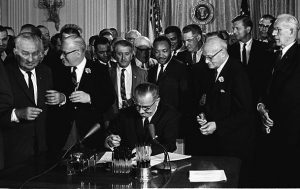 JS: The Urban Renewal Administration (soon renamed HUD) provided significant funding for urban land conservation for many years, from around 1961 to 1974. The focus was on preservation of open space within cities and towns. The program worked with more than 1,000 local governments to acquire 380,000 acres of open-space. Although the open space grant program was terminated in 1975 with the advent of the Community Development Block Grant (CDBG) approach the requirement that HUD approve proposals to convert urban open space parcels to new uses remained in effect until 1983. Since that time, urban communities have had the unfettered option to convert open spaces purchased with federal funds to alternative uses without oversight or review. Unless protected by some other instrument, such as local zoning controls or an easement, as is true at Lloyd House in Alexandria, it would appear that vast areas of open space within American cities remain unprotected and subject to potential conversion and development. As with other urban renewal programs, the historic preservation community tried to shape the direction of the grant funding away from wholesale demolition and towards stewardship of existing resources. In 1976, on the tenth anniversary of the National Historic Preservation Act, Robert Rettig reflected on the status of the federal approach to historic preservation. “All in all,” he noted, “the confrontation between national historic preservation directives and existing urban renewal and housing programs was not a success story.” New challenges, based upon new legislation, would continue HUD’s muddled relationship with the historic preservation community throughout the 1970s. In addition, the urban open space grant program laid an important administrative foundation for a new and more extensive federal program: the Land and Water Conservation Fund (LWCF). LLO: Since World War II, there appear to have been significant opportunities for land conservationists and historic preservationists to join forces. Yet, the movements still seem separate to a great extent. Why do you think that is? JS: The simple answer is stovepipes—each bucket of funding and its bureaucratic water-bearers were targeted to a particular type of resource, either land conservation or historic preservation. Until 1966 the National Park Service was significantly hampered by a legislative mandate that limited its involvement to nationally significant properties only. Thus, it was impossible for the agency to substantively contribute to most urban renewal projects, or in the analysis of surplus properties. The revitalized recreation movement that developed in the mid-1960s with the creation of the Bureau of Outdoor Recreation and the Land and Water Conservation Fund had little interest in collaborating with preservationists. There was, perhaps, a chance in the late 1960s for the emerging environmental movement to unite old school land conservation and historic preservation groups through the concept of the “total environment” and “cultural landscapes.” However, even with the creation of the Historic Preservation Fund in the mid-1970s it was apparent that land conservation and other federal programs would always be better funded and have a greater potential impact on historic properties than the stand-along preservation programs. Regardless, advocates on both sides immediately recognized, as noted by Representative Francis Bolton at the White House conference on Natural Beauty in 1965, there simply would never be enough public funding to do all that was necessary in land conservation and historic preservation. LLO: Are there any stories or case studies that didn’t make it into the book that you would like to share? There are two curious stories about the adaptive use of surplus properties that I would like to have pursued further. One involves the adaptive use of Second Bank of the United States by a Philadelphia-based German/American cultural exchange organization in the late 1930s. The public-private partnership was to be the model for the active reuse of surplus federal buildings, that is, until the whole project was almost cancelled because the non-profit group was accused of being Nazi sympathizers. The second story centers on a proposed joint US-Soviet Union historic preservation project during the Nixon administration in the aftermath of the second Strategic Arms Limitation Treaty. Similar to the cooperation envisioned by the Apollo-Soyuz space mission, both countries were to collaborate on the adaptive use of a surplus federal building. The site selected in the United States was the Old Post Office on Pennsylvania Avenue in Washington, DC. LLO: What are you working on next? 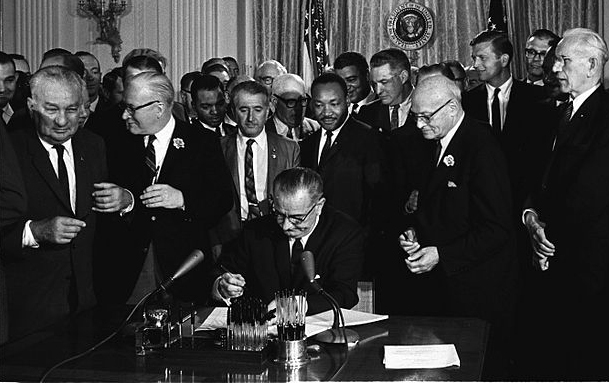 President Lyndon B. Johnson signing the National Historic Preservation Act in 1965. JS: On October 15, 1965, the day President Lyndon Johnson signed the National Historic Preservation Act in Washington, DC, Bobby Seale and Huey Newton established the Black Panthers party in Oakland, California. The accidental conjunction of two significant events in two very different social movements spurred me to wonder: how did the historic preservation movement responded to the civil rights movement over the next fifty years. I am working on another book-length examination of how the expansion of the types of spaces and places thought to be worthy of conservation reflects whether we now see the consideration of heritage as a civil right. Don Hellman, the former Assistant Director for Legislative and Congressional Affairs for the National Park Service. Don ended his 40-year career working with Congress at the beginning of 2017, which included the last 22 years with the National Park Service. Emily M. Bateson, coordinator for the Network for Landscape Conservation. She was previously Conservation Director at the Highstead Foundation and Coordinator of the New England Wildlands and Woodlands Initiative. Jackie M.M. 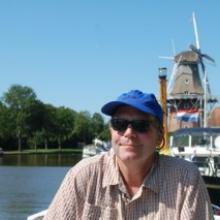 Gonzales, an environmental historian with experience working in the nonprofit and public sector.